The student asking the question, Brooke Thawley (Hayley Orrantia), is grieving the death of her brother. Being raised in an atheist home she is surprised to discover that her brother owned a Bible which she receives when a kindly volunteer gives it to her after the Salvation Army finished packing up her brother’s worldly possessions. The first thing she sees when opening it is that her brother has John 1:12 written in the front cover, "But to all who did receive Him, who believed in His name, He gave the right to become children of God. "Thawley’s study of the Bible prompts her classroom question. Although Wesley is a Christian, she hadn’t included Jesus in the lesson plan; it was Thawley who brought Jesus into the discussion. In the shadow of the ensuing court case involving her teacher, Thawley becomes a Christian. Alongside this plot and the court case Cronk weaves in characters from the previous film. Pastor Dave (David A.R. White) is selected for the jury and works through a ripped-from-the-headlines style subplot about the state issuing subpoenas for his sermons similar to what happened in Houston, Texas in 2014. Foreign exchange student Martin Yip (Paul Kwo), who became a Christian in the previous film, is disowned by his atheist father and, with Pr. Dave's guidance, decides to study to become a pastor. Journalist and blogger Amy Ryan (Trisha LaFache), who likewise became a Christian in the previous film with the help of the Christian pop band Newsboys, returns to the screen along with the Newsboys. Like the first film God's Not Dead 2 has its share of theological expressions which will be familiar to Evangelical. At one point Thawley “lets Jesus into her heart” (even though there is plenty of evidence that it is the Holy Spirit via the Word of God who is creating faith in her). At another point Wesley conveys her frustrations complaining how, "Recently when I've been praying, it's like Jesus isn't letting me feel His presence. Usually I can almost reach out and touch Him but... but right now it's like... it's like He's a million miles away," to which her ailing grandfather Walter Wesley (Pat Boone) replies, "Honey, you of all people should realize when you're going through something really hard, the teacher is always quiet during the test." In both these cases and in many other references Cronk and his writing team produce a film appealing primarily to emotionalism. Christians not coming from an Evangelical tradition will more than likely find this approach wanting. Early in the film, as it looks like the local school board is mounting a case against her, Wesley says, "I am not going to be afraid to say the name Jesus." This reveals the general premise of the film: Christians should not be afraid to say the name Jesus in their vocation; they should have the right to freely exercise their religion with no abridgement to their free speech concerning it; and Christians should be ready, as St. Peter says in 1 Peter 3:15 (and as the film quotes), to "always [be] prepared to make a defence to anyone who asks you for a reason for the hope that is in you; yet do it with gentleness and respect." Honouring Jesus as Lord and God is not only something done quietly in the heart but also something confessed with the lips. While better than the first film, God’s Not Dead 2 is still not very good. As a courtroom drama this is notTo Kill A Mocking Bird (1962), Twelve Angry Men (1957) orA Few Good Men (1992); it isn't even on a par with TV courtroom dramas. In fact, it is less like Law & Order (1990 - 2010) and more like Matlock (1986-1995), which is to say that God's Not Dead 2 is firmly seated in the realm of courtroom fantasy and melodrama. If a third God's Not Dead is made in which yet again the final outcome of the plot is determined by having Newsboys fans in an auditorium pray to fulfil a prayer request during a concert, the whole endeavour will be in grave danger of moving from melodrama to self-parody. While the film deals with a serious topic—the persecution of Christians within the increasingly volatile arena of public discourse—God's Not Dead 2 is not a serious film. That said, the film takes itself seriously, however nine times out of ten it fails in its Christian apologetic goals. To be charitable, there are a couple of moments where real apologetics are introduced in the form of cameos. In an effort to simply prove Jesus existed as a historical figure worthy of discussion in a public school history classroom the defence (Jesse Metcalfe) calls witnesses like Lee Strobel, author of The Case for Christ (1998), and J. Warner Wallace, author of Cold-Case Christianity (2013). During his cross-examination Strobel even mentions the agnostic scholar and historian Bart Ehrman as one who believes Jesus is a historical figure. Viewers looking for a more serious drama on the topic may well be left wondering what a film would be like if it included these and additional cameos by the likes of Christian apologist and lawyer John Warwick Montgomery as well as atheists like Richard Dawkins and Sam Harris. Is it fair to wish that the film was different? A more serious film might have a wider appeal drawing in non-Christians, agnostics and atheists, inviting contemplation not rooted in emotionalism. 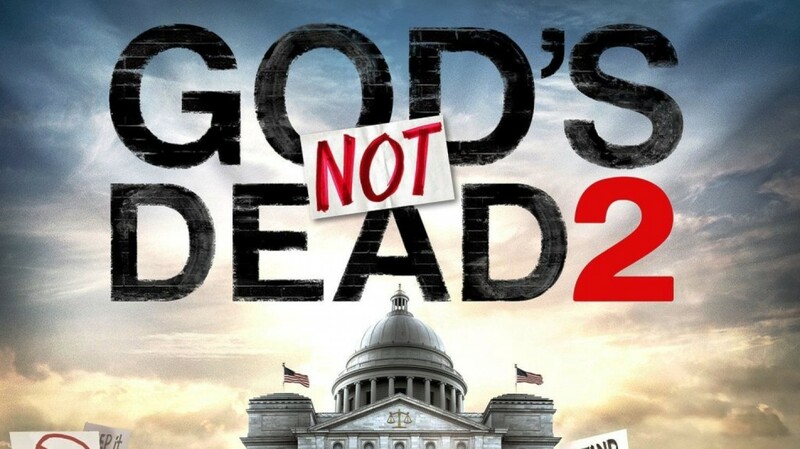 In true melodramatic fashion God's Not Dead 2 ends with an overwhelmingly positive conclusion. At one point Wesley makes the assertion, "I would rather stand with God and be judged by the world, than stand with the world and be judged by God." Would that the film had ended with her losing the court case, her job, and her life's savings. That would have been a more interesting movie. In the Acts of the Apostles we read about the apostles being detained for teaching in the Temple about the resurrected and ascended Jesus. They were called before the Sanhedrin and, after being beaten, the council "charged them not to speak in the name of Jesus, and let them go. Then they left the presence of the council, rejoicing that they were counted worthy to suffer dishonour for the name. And every day, in the temple and from house to house, they did not cease teaching and preaching that the Christ is Jesus"(Acts 5:40-42). The film had this potential drama built into the plot by showing the Christian faith in the face of worldly condemnation, however it didn't act on that potential; if it had God's Not Dead 2 had done so it would have been a very different film. One of the featured Newsboys songs at the end of the film has the lyric, "I want to be guilty by association." How much more poignant that song would have been had Wesley lost the court case leaving viewers with a bent-but-not-broken teacher determined to appeal the decision to a higher court? One last point: Cronk and his writing team seem to have forgotten the second part of 1 Peter 3:15 where it says that the defence a Christian should always be ready to make should be done "with gentleness and respect." The atheists in this film are not treated with gentleness or respect and neither are atheists in general. Thawley's parents are depicted as rather callous people who after six months no longer grieve the loss of their dead son and have no sympathy or empathy toward their daughter who still grieves the loss of her brother. The prosecuting attorney, Peter Kane (Ray Wise), is a vitriolic-moustache-twirling-style-two-dimensional-villain who literally says he "hates" people like Wesley and what he calls their "repressive [Christian] belief system." He hopes to prove "once and for all that God is dead." Even Wesley's grandfather cavalierly piles-on saying, "That's the thing about atheism, it doesn't take away the pain, it takes away the hope." There is nothing particularly kind about how the film portrays or approaches atheists; they are not made to be people like the rest of the characters. It is concerning that God's Not Dead 2 is more focused on self-pity and the desire to be vindicated in the eyes of the world than it is on kind and considerate treatment of antagonists to the Christian faith. Returning to the question, “What do viewers do when this noble,good, and right Scriptural truth is wrapped up in a mediocre movie?” Pray that someone will endeavour to make a more thoughtful film dealing with Christian apologetics and civil liberties—a film with writing, directing and acting more on the level with Spotlight(2015) which managed to deal respectfully with both faith and a serious topic impacting Christians. Let movies like God's Not Dead 2 be a reminder to seek out credible resources on the topic of apologetics when preparing for a personal defence before friends, family and strangers. But don't be guilted into saying the film is good just because the topic is important. In the Gospel of Luke, John and Jesus have this brief conversation where John says to Jesus, “Master, we saw someone casting out demons in Your name, and we tried to stop him, because he does not follow with us.” But Jesus said to him, “Do not stop him, for the one who is not against you is for you.”(Luke 9:49-50) So, without demanding that directors like Harold Cronk stop making films, in Christian freedom viewers are free to say that the film is a melodrama and also in Christian freedom can ask, "Please give everyone something better." 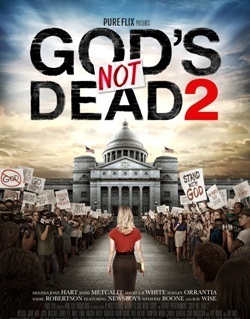 And finally, as with other films at the multiplex, Christian filmgoers can go ahead and see God's Not Dead 2 or they can freely skip it altogether.